FIVE new businesses have opened in Beckenham in the last few weeks. Children’s and young family concept store Ollie And Dollie joins Burgers and Bubbles bar and burger restaurant, Poached coffee shop, breakfast and brunch restaurant, Bunka, a lifestyle store, and Agora, a new Mediterranean restaurant. Please pop in and show your support. Looking for a new workspace in Beckenham? The new Desk Team business facility on Croydon Road, Beckenham, provides a wide range of high quality workspaces to let, including serviced and managed offices, events and networking opportunities, on flexible monthly memberships which include business support, a hot desk or lockable office space. Additional benefits include a range of in-house businesses, such as a Print & Merchandise shop, a stationery ‘tuck shop’ and a café/Juice Bar. Desk Team is holding an Open Day on Thursday 30 November, as an opportunity to come and see the building, meet the team and try out the space. A Start-Up Business Expo is being planning for early 2018. Details to be announced soon! For more information on Desk Team and the facilities available, visit the Desk Team website or call 020 3773 3223. This year Beckenham's Christmas Market On The Green and Candlelit Parade coincides with Small Business Saturday on 2nd December. Small Business Saturday is a national event to encourage people to shop local and support their small businesses. We want all kinds of small businesses to get involved, so whether you are a family business, local shop, online business, wholesaler, business service or small manufacturer, Beckenham Business Association and Small Business Saturday is supporting you! For all the ways you can get involved visit the Small Business Saturday website. On Saturday 2 December Beckenham Town Centre will be hosting its annual Christmas Market on the Green and a candlelit parade. Christmas on the Green, including entertainment on stage, is organised by Copers Cope Area Residents’ Association, and starts at midday. 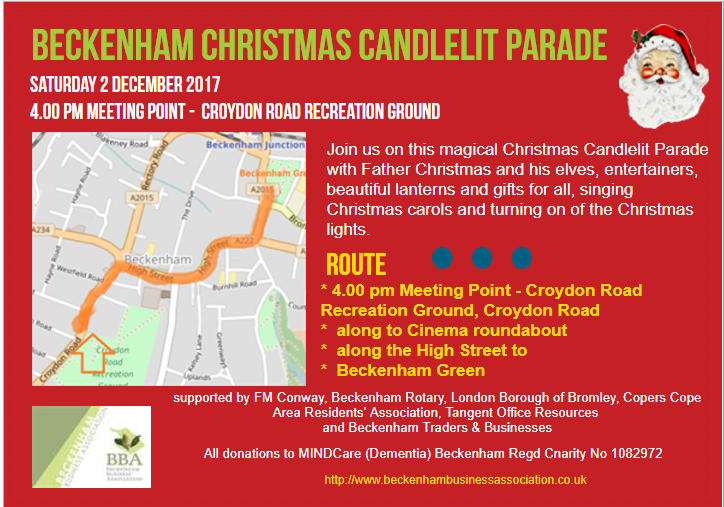 The candlelit parade, organised by Beckenham Business Association, gathers at Croydon Road Recreation Ground at 4pm, ready to leave by 4:30pm and finishes at Beckenham Green for the Christmas lights switch on at 5pm. Father Christmas will be there, helped by his little elves who’ll be handing out Christmas gifts (with thanks to F M Conway and their float) along the route. Leaving from Croydon Road Recreational Ground at 4.30pm, the route goes along Croydon Road and through Beckenham High Street, with lots of singing and fun along the way. It culminates on Beckenham Green for the official turning on of the Christmas Lights and Carol singing at 5pm. There will be pretty Christmas (battery) lights for the children, entertainment, bands and lots more fun for all the family. This is a great opportunity for businesses to promote themselves along the route. If you would like to take part in this event in some way, please let us know, so that we can promote and help you with this.